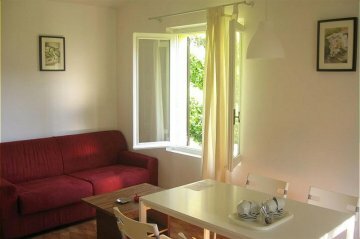 This apartment is part of a beautiful bungalow park that borders Lake Idro. The complex has Dutch management and is ideal for family holidays. The accommodations of the park are suitable for 4 to 6 persons. Facilities include a cozy restaurant, pizzeria, mini-market, tennis courts, table tennis table and a large swimming pool (20 x 10m) from where you have a beautiful view of the surrounding mountains and lake. Lake Idro is well-known among nature lovers because of its clear water, afforested hills and old mountain villages. It is an area that has not been affected by time and thus is ideal for nature lovers as well as those who do not wish to go to a touristy area. From mid-June to mid-September there is a surfing school in the park (you can rent surf boards). The lake has a natural rocky beach. Lake Idro is hidden between the spurs of the Dolomite Mountains. On the map it's just a tiny drop but in reality it's rather large at 12km in length. In summer there are various activities organized in the park. For example, there is an adventurous guided orientation trip for children under 16 years of age and guided hikes for beginners as well as more experienced hikers. Each week there are a variety of organized sporting events but you can also go swimming, surfing, sailing, climbing, paragliding or canyoning here. In the area you will find a number of picturesque mountain villages, where the old atmosphere remains with narrow roads, balconies adorned with flowers and ancient gates and courtyards. On a day trip you can visit Lake Garda or the historic towns of Verona and Venice. In Arena di Verona, classical operas are still performed. Each week there are various markets in the area. They are open from 8:00 till 12:00. This holiday accommodation is situated in a large detached house that has been divided into 4 apartments. This apartment is suitable for 2 to 4 persons and is located on the first floor. The apartments on the first floor have a balcony with a view of the mountains and lake. The total area is about 32m2. The living room has a large double bed couch. There is a bedroom furnished with two single beds placed next to each other (or 1 double bed). The kitchen is set up in a corner of the living room and is equipped with a 4-burner gas cooker, fridge/freezer and coffee maker. The bathroom has a shower. All apartments have modern equipment. Included in the price are a Baby Set (except in summer), energy costs. The pool is open from half May to half September. Bathing cap is compulsory. Towels and kitchen towels need to be brought. You can hire bed linen for €10,00 per person or bring it from home. The cost of bed linen has to be paid on the spot. A baby set in period 22/06 -06/09 can be hired for €35,00 (baby bed, buggy and high chair). Pets are allowed on a leash and their waste needs to be collected. There is a washing machine and tumble dryer. Motor boats with more then 10hp are not allowed on Lake Idro. You can collect a boating certificate at the office. There are international daily newspapers on the park. Fishing is allowed but you need a tourist-license. You can collect that at the post office. they can not lie on the couch or on the blankets. At the departure of our customers, unfortunately very often we find very dirty houses with dog hair everywhere. For this reason we kindly ask you to respect these simple rules.